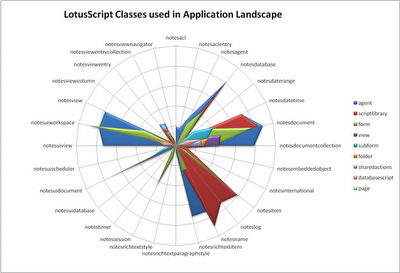 The radar plot above shows separate colors for each type of design element, and how standard LotusScript classes have been used in the source code of all applications within this IBM Lotus Domino environment. Custom, self-developed classes can of course be displayed in a similar fashion. Most lines of code were found to exist in notes agents, script libraries in second place, etc. Notice how script libraries in Lotus Notes tend to use more back end classes, especially NotesName, NotesDatabase, NotesDocument, NotesItem and NotesLog. Agents and forms are the most frequent users of the front end classes NotesUIWorkspace, NotesUIView and NotesUIDocument. How useful is this? I'm not sure, just think it looks pretty ;-) What do you think?.